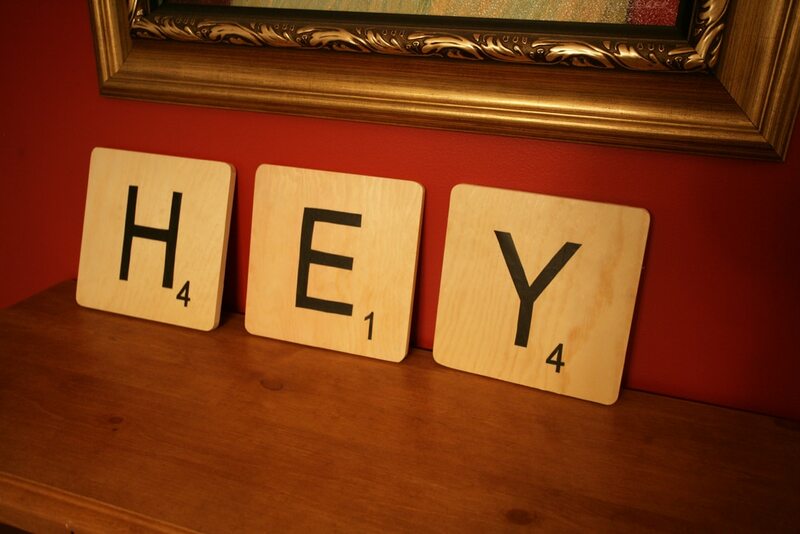 While wandering around the DIY blog world last week, I found these awesome Scrabble tile boards from Shanks – Est. 2009. I thought I would give this project a whirl! So above is Shanks’ version, and here’s mine! First step was to track down my supplies. I headed to the nearby Michael’s and picked up some 12×12 inch wooden tiles for $1.99 a piece. They had a border around the edges, but I figured I could flip the boards over and use the back as my clean surface. Plus I really loved them cause they had an awesome wood grain pattern that made them look like actual Scrabble tiles! I decided to pre-treat them with a clear coat of polyurethane to give them a little bit of a shine and hard coating. 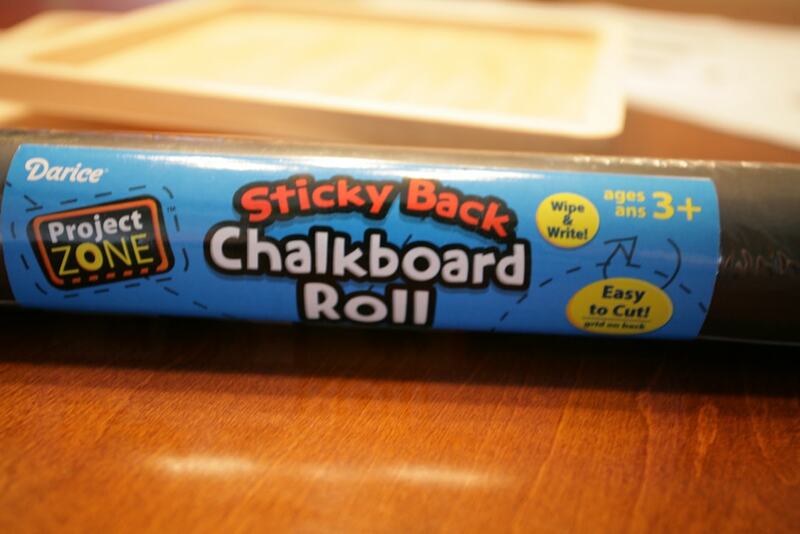 Next I found some sticky back chalkboard paper in a roll. I’ve never used this stuff before, but thought it was worth a shot for $5 a roll. Now to get down to business! I looked up Scrabble tiles online to make sure I got the right point value matched with the right letter. I then printed them out on normal printer paper. 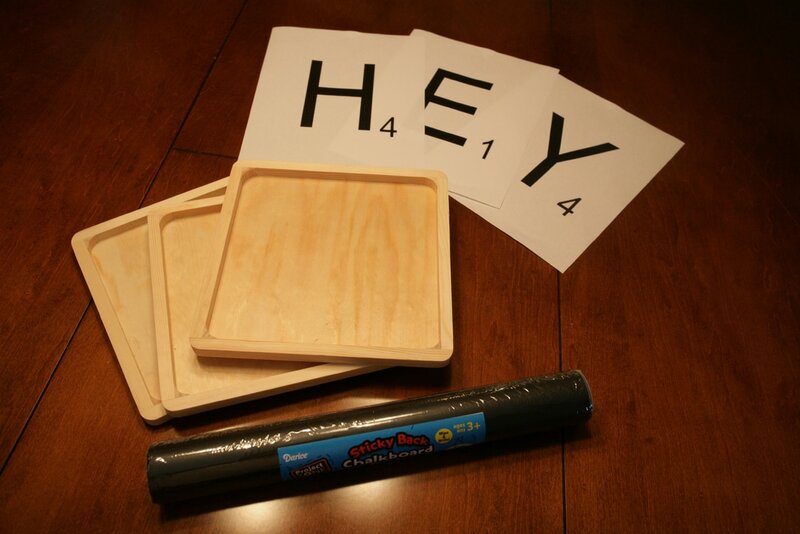 I cut the letters and numbers out with scissors, then used those as my template for the chalk board paper. Yes, I’m sure there was an easier way, but I couldn’t find my exacto knife anywhere! 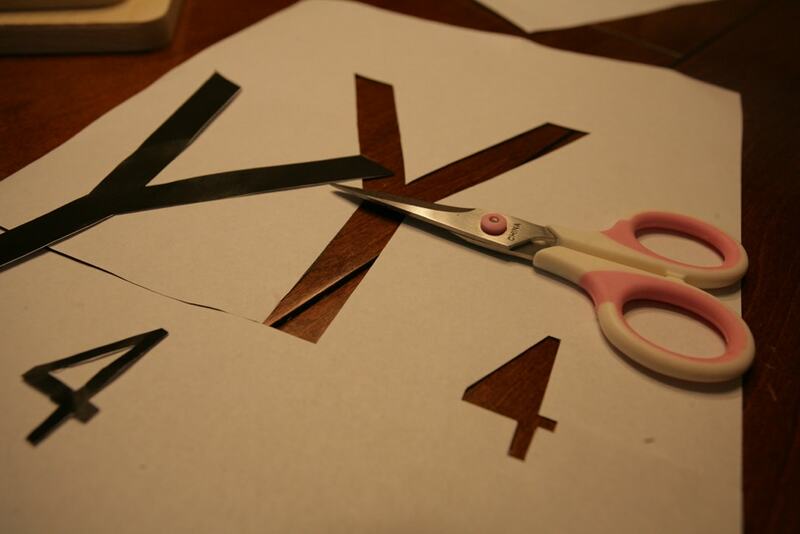 So alas, scissors and tracing will have to do! When all of the letters were cut out, I peeled the back label off and stuck them to the boards. They’re repositionable so it’s pretty easy not to screw this part up! I just made sure to press it down hard when I was happy with the position to lock it into place. Final costs: $6 total for the 3 tiles and $5 for the chalkboard paper (which I probably used only 5% of the entire roll!). Not too shabby of a project for $11. Well here’s the finished piece again! 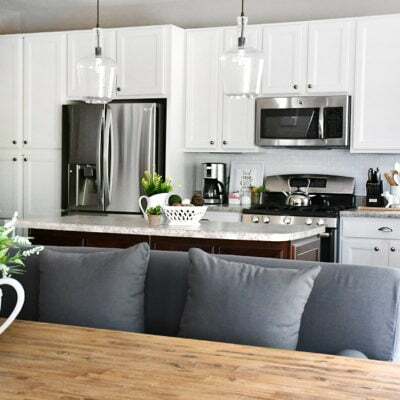 If you want some of these cool tiles for your home, visit Shanks – Est. 2009 or you can buy them from her Etsy page by clicking here. Love them. I like that they are ‘over-sized’. Just makes them that much more fun. Thanks for stopping by 30days. I love your blog too! 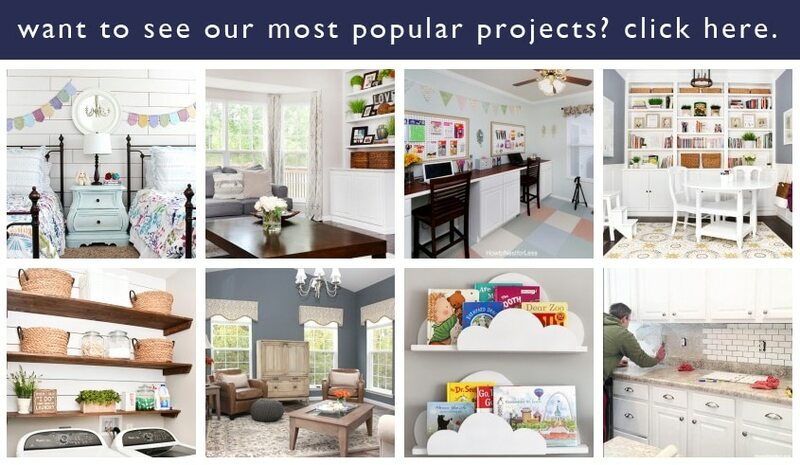 I’m planning on redoing a bunch of rooms in my house this summer so I can’t wait to go back and read all your posts. Have a great weekend. I am new to this but what a neat idea. This will look cool in our game room. May I ask where you found the chalkboard vinyl please ? Was it at Michaels too ? Yes, from Michael’s. Also, another idea is using black sticker paper. You can find that in the scrapbook paper aise in Michael’s. 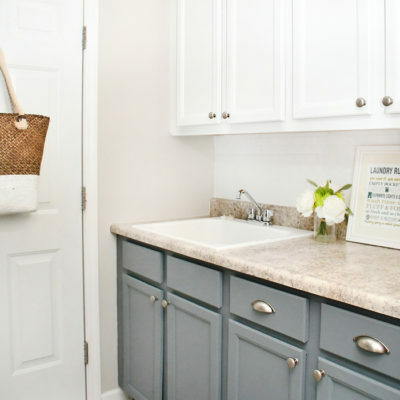 Or another great product to use would be contact paper from Lowe’s! do you have a link to the wood ’tiles’? are they frames? The tiles I used were just cheap wood cutouts that I purchased from Michael’s. I don’t see them on their website though. Such a cute idea! 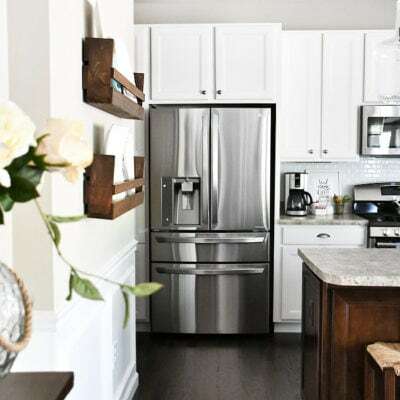 (I especially like the shape of the wooden plaques.) Definitely on my to do list! That could be a cool place setting for a table! 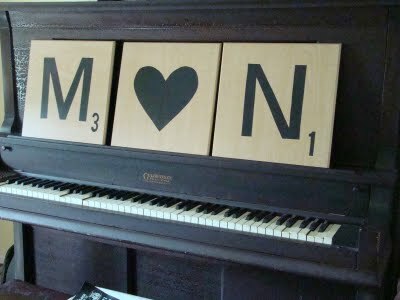 I thought about having a Scrabble table theme at a ladies event at our church event next year. That would be easier than trying to collect 6-8 scrabble boards.